Conversations are fundamental to being human. They are also central to our learning. A toddler learns by asking her parents “Why?” incessantly. Socrates began his famous dialog with Meno: “May we find out the meaning of virtue together?” Conversations promote learning through an exchange of ideas. Muzzy Lane and others have been thinking about how conversations can benefit online learning. One source of inspiration is digital game design, where simulated conversations have been an important strand. Early role-playing games featured computer-controlled characters that delivered monologues. Later, games like Neverwinter Nights added more complex interactions with characters. Players could now choose what to say, and character responses and game outcomes changed based on their choices. Popular games like Phoenix Wright – Ace Attorney have made conversation the central activity. Players gather interview evidence and interrogate witnesses to win cases in the courtroom. 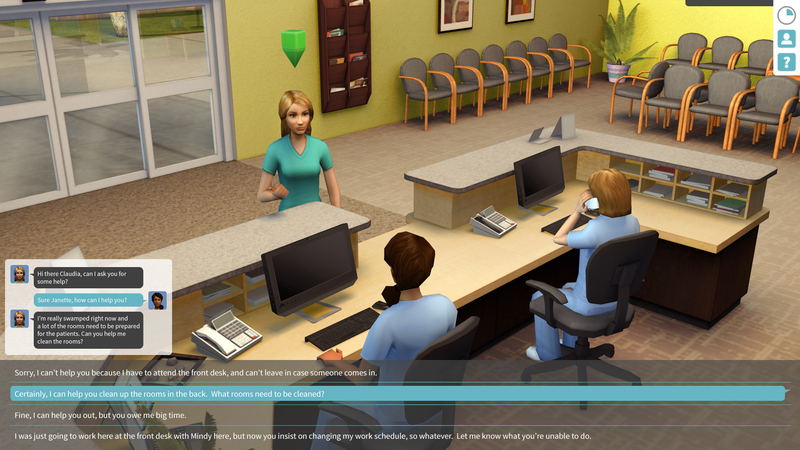 Computer-based characters can provide mentoring and scaffolding through conversations. In our work, we use different conversation models to meet particular learning objectives. In Past/Present, students take the role of an immigrant mill-worker in 1906. Through conversations they gather evidence on mill unrest to help decide whether the mill workers should strike. In Practice Medical Office, students build their skills in a real-world context by conversing with patients in authentic contexts. Health-game developer Kognito has focused on creating immersive learning experiences to practice difficult conversations around health. ChangeTalk provides training in managing challenging conversations about childhood obesity. In Practice Spanish: Study Abroad, students build language skills through interactive conversations based on the kinds of situations they would encounter actually studying abroad. Quandary (from the MIT Education Arcade and LGN) engages students in ethics by helping them take different perspectives as captain of a space mission. They speak with space colony members to understand their opinions and what lies behind them. Then they negotiate important decisions to keep everyone alive. What’s next? At Muzzy Lane, we’re working on tools to enable educators to easily create conversation-based learning experiences. What learning experiences would you create using conversations? What subjects, issues, and objectives are you thinking about tackling? We look forward to hearing from you, and in future posts we’ll talk more about the tools we’re developing, and other aspects of Conversational Learning.